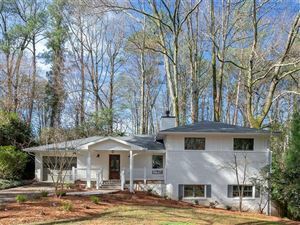 Sagamore Hills is a beautiful neighborhood in Atlanta originally developed in the 1950″s and 60″s bordered by Clairmont, Briarcliff, Lavista, and Oak Grove Roads. Most of the original four-side brick ranches are still there and have been well maintained over the years. Some of the original residents still reside in the homes, but in recent years, young professionals and new families have bought their first or second homes in Sagamore Hills. This neighborhood is conveniently located near the Clairmont exit on I-85, VA Hospital, Emory Univeristy, and Toco Hills Shopping Center and offers easy access to downtown Atlanta and Buckhead. Despite being so close to the city, you”ll be surrounded by mature trees and beautiful scenery while walking along the streets of Sagamore Hills. The neighborhood is zoned for some of the best public schools in Atlanta, including Lakeside High School and Sagamore Hills Elementary. Cliff Valley School, located across Clairmont from the neighborhood, is a small private school offering pre-K through 5th grade. The school is currently undergoing a renovation/expansion project allowing them to add 6th grade this Fall and adding 7th and 8th grades in the subsequent years. Sagamore Hills is also near several places of worship including the Greek Orthodox Cathedral of the Annunciation, which hosts an annual GreekFest offering great food, performances, and art. The Sagamore Hills Civic Association offers membership to residents for $25 a year, which goes towards neighborhood beautification projects, security in the form of off-duty police patrols, and legal fees associated with preventing zoning infringements. Sagamore Hills” residents are dedicated to preserving the neighborhood”s prominent beauty and safety. Data last updated: 4/25/19 1:53 AM PDT.